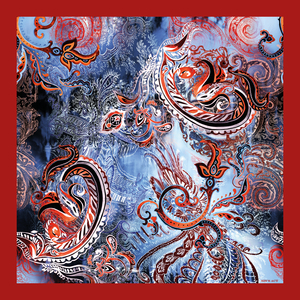 Scarf in 100% silk (silk twill) with a generous size of 90 x 90 cm. 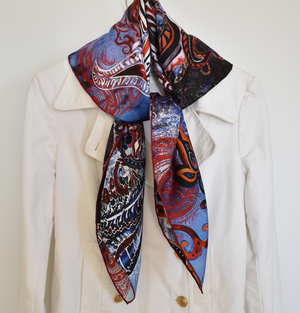 An exclusive silk scarf that is classic chic and adds natural elegance to any outfit. 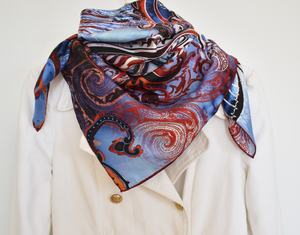 Silk twill is a strong a strong and soft silk quality that can be knotted in countless ways. The patterns are our own design and in digital print which means that the back side has a slightly weaker color. Care. Weather the scarf so it stays fresh longer. Washing: We recommend dry cleaning but hand washing at low temperature with mild detergent (or preferably a silk soap) . Iron on low heat.